Acorn BASyC™ is ideal for any facility's recirculating domestic hot water system where optimal bather safety is desired. It provides distributed controland monitoring of Acorn Controls MV17 mixing valves and a wide variety of temperature, pressure and flow sensors. Utilizing NiagaraAX software, the Acorn BASyC™ can aggregate information (real-time data, history, alarms, etc.) from an array of sensors. Acorn BASyC™ can connect to a facility’s local area network and/or the existing BAS via industry standard network protocols. A highly customizable report generator with the ability to export the data to a pdf, HTML, TEXT or CSV file for analysis beyond BASyC’s powerful internal capabilities. BAS adapters for BACnet, Lonworks, ModBus or oBIX without external adapters or gateways. The capability of 34 inputs/outputs: 16 universal inputs, 10 relay outputs, 8 analog outputs. 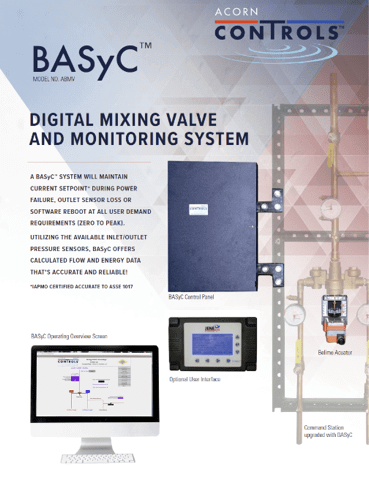 One BASyC system can control up to 4 valves and 2 separate temperature loops or zones. A BASyC system is based on an control valve included as part of a Command Station or Supply Fixture assembly. BASyC’s open architecture allows for cost-effective customization. Any input or output not used for the recirculating LTHW application can be assigned to monitor and activate or control third party devices. Contact Acorn for details and a price quotation. User-selectable outlet flow sensors give BASyC the capability to provide accurate flow and energy data at any user demand. BASyC is a 24 volt system and does not require an electrician for installation. Simply connect it to the nearest available 115 VAC outlet. 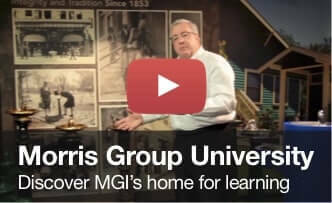 Redundancy in capacity and/or control available without the cost of a fully duplicated system. BASyC has the flexibility to offer whatever level of redundancy required at a low cost. An off-the-shelf, proven reliable, Belimo valve actuator with auto-ranging to make replacement fast, simply and low cost. Time-consuming and complicated repairs or servicing are never necessary.